Apple iPad Air 2, iPad Mini 3: Apple’s tablets have become boring. 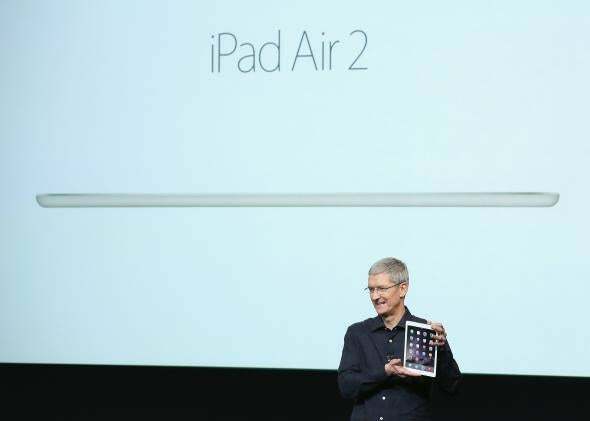 Tim Cook tries his best to look excited about the iPad Air 2. 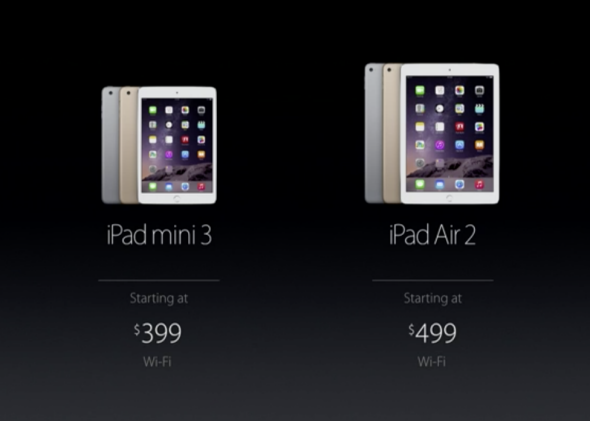 In what has become a fall ritual, Apple on Thursday announced a pair of new iPads: the iPad Air 2 and the iPad Mini 3. In what is also starting to become a fall ritual, the company’s new tablets look a lot like the old ones. The headline is that the Air 2 will be even slimmer than its predecessor. When Apple announced the first iPad Air last year, it showed it hiding behind a pencil. This time it showed the Air 2 hiding behind … an 18 percent thinner pencil. At just 6.1 millimeters, it’s now half the thickness of the original iPad. “Can you even see it?” Apple CEO Tim Cook joked, a little halfheartedly. The company’s new flagship tablet will come with significantly better graphics processing and an A8X chip that Apple says is 40 percent faster than its predecessor. 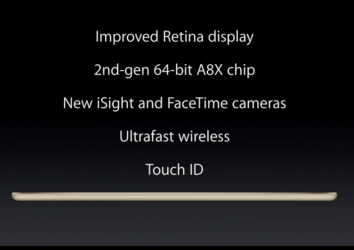 A laminated screen will reduce glare, and the 8-megapixel iSight camera will shoot video at 1080p. The new iPad Air is 18 percent thinner than the last one. The Mini 3, meanwhile, rated barely a minute’s mention in the course of a nearly hour-long event Thursday in Cupertino. The company announced the new device in approximately the tone that I used as an 8-year-old to announce to my father that I broke the porch light with my ball. Both new tablets will come with Touch ID, the fingerprint sensor that Apple has offered on its last two generations of iPhones. Oh, and they’ll come in one new color: gold. But we already knew all most of that, because Apple accidentally (or accidentally-on-purpose) included screenshots of the new devices in the iOS 8.1 user guide that appeared in iTunes a day early. The only real surprise Thursday was a quirky cameo by Stephen Colbert, who joined the launch event by phone posing as the company’s bumbling chief of security and cracking dad jokes about dad jokes. It was an appropriate theme for a gadget that appears to be settling into a comfortable middle age. A lot of people still can’t justify spending this much on a gadget they don’t really need. No doubt these are both fine tablets that will continue to lead the market and please those customers who can afford them. I have an iPad Air at home and it works beautifully for streaming baseball games on my kitchen counter while I do the dishes. Apple announced Thursday that it has sold more than 225 million iPads in all, and more in the past 12 months than any PC-maker has sold PCs. That’s impressive. Yet the growth in iPad sales has stagnated of late, perhaps in conjunction with the rise of giant smartphones, and the new ones offer nothing that will entice people who weren’t already in the market for one. Apple is treading water in a sector that appears to have matured faster than pundits had predicted. A significantly larger, 13-inch iPad rumored to be on tap next year could shake things up. In the meantime, though, competitors such as Microsoft and Amazon have a chance to gain ground on Apple with tablets that push the category in fresh directions. Microsoft’s Surface tablets have been hamstrung by an unpopular software interface, but the hardware is first-rate, and their productivity apps surpass Apple’s already. What’s interesting about the Surface 3 is that Microsoft is marketing it not as a shiny toy, but as an all-in-one replacement for your laptop. Amazon’s latest devices include an ultra-cheap Fire tablet and an interesting new “Kids Edition” that comes with a “no-questions-asked” warranty. Both of those companies are trying to solve the fundamental limitation of the tablet category, which is that most people can’t justify dropping $500-plus on a gadget that they don’t really need. Apple, in contrast, appears to be working within that limitation, which may make good business sense in the short term but is not a recipe for explosive growth. When people approach middle age, their birthday celebrations tend to become a little more restrained. Next time Apple has an announcement this incremental, maybe Tim Cook and company should skip the hoopla and celebrate with a quiet dinner at home. *Correction, Oct. 16, 2014: This post originally misstated that the iPad Air 2 weighs .96 ounces.